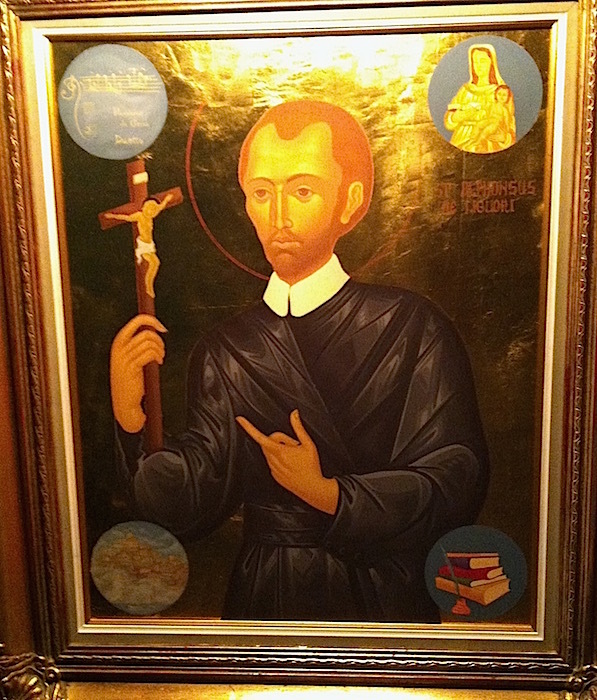 St.Alphonsus de Liguori, Founder of the Redemptorists. Feast August 1st. Alphonsus was born 1696: just eight years after the ‘Glorious Revolution’ of 1688 in England when King James, the Catholic King, was challenged by his son-in-law, the Dutchman, William of Orange. Catholic Ireland was now under Williamite and Protestant Rule from 1691. 1705: Handel’s first Opera, Almira. 1710-11: Russia and the Ottoman Empire at war. 1715: Louis XVI dies, the end of an era. 1718: New Orleans is founded by the French. 1729-1735 Charles and John Wesley begin Methodism in England. 1730-36: Volcanic Eruptions in Lanzarotte, probably experienced in mainland Europe. 1732: Alphonsus de Liguori and his companions begin the Redemptorists, Missionary Preachers to the most abandoned, in Scala, Italy. Meanwhile, in other parts of Europe and on the N. American continent, ‘The Great Awakening’ was taking place, revivals very similar to the work of Alphonsus and his first ‘Redemptorists’. 1730’s – 1740’: From Wikipedia: ‘The Great Awakening or First Great Awakening was a Protestant religious revival that swept Protestant Europe and British America in the 1730s and 1740s. An evangelical and revitalization movement, it left a permanent impact on American Protestantism. It resulted from powerful preaching that gave listeners a sense of deep personal revelation of their need of salvation by Jesus Christ. (Google ‘The Great Awakening’ for more). 1738–1756: Famine across the Sahel; half the population of Timbuktu dies. 1748: Discovery of the ruins of Pompei. 1770: James Cook claims the East Coast of Australia (New South Wales) for Great Britain. 1785: Clement Hofbauer and his companion are the first Redemptorists from Northern Europe, and return to Vienna and then on to Warsaw, to seek to set up the Redemptorists in those places. Alphonsus was aware of them and was delighted. 1787: The United States Constitution is written in Philadelphia and submitted to the states for ratification. 1787: Death of Alphonsus de Liguori, August 1st. 1792: Polish–Russian War of 1792. Bach, Gluck, Handel, Haydn, Mozart, Salieri, Albinoni, Boccherini, Pachalbel., Scarlatti, Stradivari, and Isaac Watts, hymn writer. Philosophers of the Century: George Berkeley, David Hume, Edmund Burke, Immanuel Kant, Friedrich Von Schiller, Thomas Paine, Jean-Jacques Rousseau, Alphonsus Liguori, Italian bishop, founder of Redemptorists, Saint. Through all of that period, Alphonsus first preached popular missions/ renewals in villages and towns throughout Southern Italy. Later, he wrote continuously, against the heresies and severities of Jansenism, and encouraging popular devotion among people, in language that was simple and straightforward. His major work was in the area of moral theology, counteracting the severity found among so many writers. He is the Patron of Moral Theologians. The works he loved most were short ones on prayer, on devotion to the Sacred Heart of Jesus. His favourite among all his writings was ‘The Practice of the Love of Jesus Christ’. He also wrote Visits to the Blessed Sacrament, and The Glories of Mary. Rationalism was rampant through those decades, a ‘rationalism’ that was unreasonable in its myopic vision of human life, and in its own heresy of ‘Nothing Buttery’ – nothing but pure reason. Even philosophers like Kant critiqued this worship of ‘Pure Reason’ – see above, ‘Writings in Europe’. Alphonsus was a man of profound compassion for humans in all their struggles. He was a man who reached out to the very edges. His love was for Christ in the most abandoned. Séamus Devitt C.Ss.R. July 31, 2017. Alphonsus did things differently. Yes, he might be found preaching from a pulpit in some Neapolitan church. But, just as likely, you would find him in the evenings, with his friend Gennaro Sarnelli (another young lawyer), sitting in some tavern or other and teaching the people how to have their own Evening Gatherings, for prayer and for hearing the Gospel. He worked with street urchins, and with people of every walk of life, people working down in the busy docks of Naples, soldiers off-duty, women, men, young people. Everyone was important to him. For Alfonso, God calls everyone to holiness, soldiers as soldiers, labourers as labourers, house-servants as house-servants, and so on. God is ‘pazzo per amore’ towards every human being without exception. Crib, Cross, Eucharist, Mary: Alphonsus would look with the people in a tavern at a crib they had fashioned. He would draw out the story of it, the feelings of those involved in it, and the meaning of it for each and all of us. Or, he would have a crucifix with him and show it, and explore it, and then pray with it. So too with the Eucharist in the tabernacle: come, look, think, ponder, pray. And he did the same with images of Mary, Mother of God, which would have been all around them in their beloved city of Naples: look at her, let her look at you! He was down to earth. He was visual. He loved music and would have them singing songs of faith and joy. He didn’t have to be in a pulpit. He could preach as well – and probably a lot better – just sitting on a stool or bench in the local bar. Alphonsus took people seriously. He took their lives and their issues and their challenges seriously. He took their consciences seriously, and helped them as best he could, to come to good honest-to-God decisions and choices. And he took their weaknesses seriously. He was a man of compassion. He wasn’t so at first as he began his ministry as priest and preacher. But, early on in his ministry as a priest, when out on the island of Procurus (in the Bay of Naples)giving a Mission, as he met people and listened to them and to their struggles, he grew in understanding of what went on in their lives, and he grew in his compassion, his feeling for them. What they needed, they told him, was Mercy, not Judgement! It was they who taught him! He showed the tenderness of God to them in Christ, in varied ways – through his words, through the way he treated them, the way he related to them in language they could immediately understand. The message he conveyed – sometimes even with words! – was of a Christ of Compassion and of a Mother of immense tenderness. He wanted them to be communities of Compassion, communities of prayer. 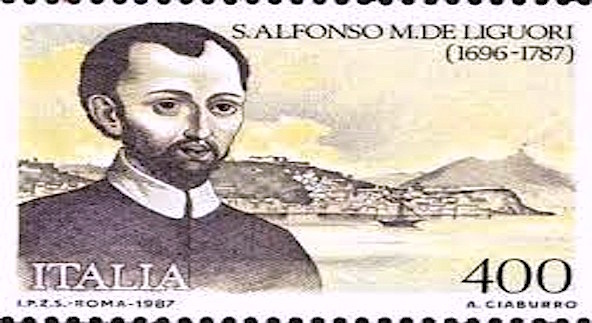 Later in his life, when illness prevented him from giving any more Missions, Alfonso wrote a lot. He wrote hymns. He wrote books to help priests as Confessors to people. He wrote books about prayer. His favourite, among all the more-than-one-hundred things he wrote, was ‘The Practice of the Love of Jesus Christ’. In this too, as in his various Novenas, he encourages us to gaze prayerfully at the Crib, the Cross, at Eucharist, at Mary. Alphonsus was a People Person. Redemptorists and their co-workers try to be the same today – passionate about people, about their lives and struggles, about showing them the compassionate face of Christ, about bringing them to Mary, the Mother of the Lord. He wanted people to come and see the ‘Peace-be-with-you!’ face of Jesus. May we be People-Persons, passionate about each human being as if the only one, and passionate about the One who came among us to lead us back home to our true selves, and to our Maker. May we, like Alfonso, come to know Christ Jesus, and be bursting to let others know about this ‘treasure’ we have found, this ‘pearl’ that we have discovered. We want the world of people to know. The ‘Treasure’ that he found? People and the wonder of them. Jesus of Nazareth, Son of Mary, Son of God, our very human brother and saviour. God’s love for us – for each and every human. The Universal call to holiness, to walk with God, to talk with God. The simplicity and profundity of the Gospel – the crib, Cross, Eucharist, Mary. The simplicity and profundity of our Sunday Mass: quiet, still, and deep. Alphonsus’ was filled with the same Holy Spirit as you and me. He responded with great love, with total abandon. Will we? ‘RETURN LOVE FOR LOVE’ – the heart of all his spirituality. Séamus Devitt C.Ss.R., July 2017. ‘In communion with the whole Church, guided by the leadership of Pope Francis, we commit ourselves to the theme of this sexennium: WITNESSES OF THE REDEEMER: In Solidarity for Mission to a Wounded World.